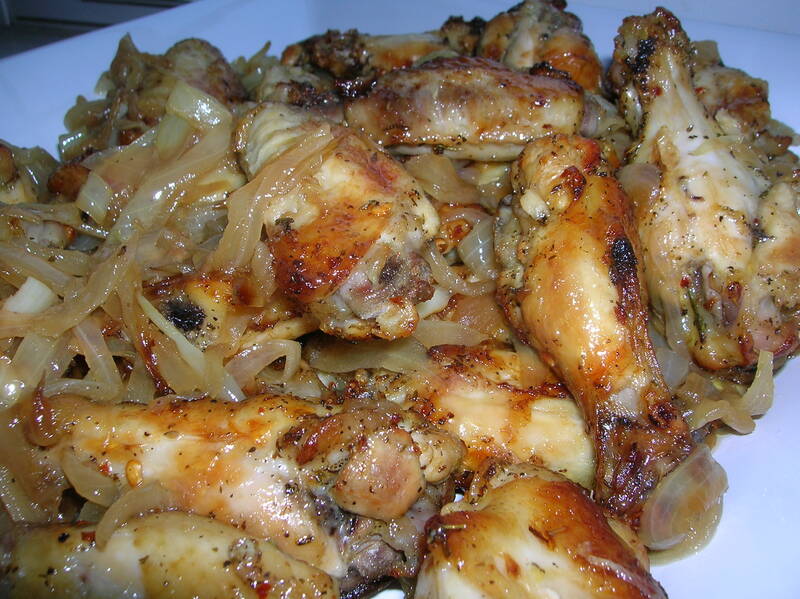 Here is a wing recipe just in time for Superbowl Sunday! Am I allowed to say that? In the print advertising world, unless you pay mucho dollars to the NFL, just saying the word Superbowl in an ad can get you into a lot of trouble and heavy fines. Have you ever heard of anything so ridiculous? Some local pub that is trying to eek out a living in this God forsaken economy by just putting a headline in their ad that says.,”JOIN US FOR SUPERBOWL SUNDAY” might get a letter from some lawyer if they catch wind of his ad. The NFL can fine him and the publication that prints the ad, unless you pay millions of dollars to the NFL for the privilege of trying to make a buck off their brand name. Can I call these Superbowl Sicilian Wings? Am I going to get a cease and desist letter? I guess if they read my blog I will. Or some reader who didn’t like the way I made my meatballs send a copy of this to the NFL. Only problem is….I’m not making a penny off of this….unfortunately. I guess if I publish this recipe in my book I’m going to have to hire a lawyer and find out if I’m allowed to call them what they are. Pappa John’s Pizza and other advertisers pay millions of dollars to be the official sponsor of the Superbowl. Because he has to pay a fortune to do that, other merchants and competitors should not be able to use the name without a price. I guess he can say “Order our sub standard pies for Superbowl Sunday” in his ads and not get in trouble. (could I get in trouble for saying that? I’m getting paranoid) I think it’s stupid to put so much value on a name. Does it really hurt the NFL if a local restaurant promotes THEIR football game and shows it on their own TV so customers can buy beer and eat wings. Oh my! We can’t have that. Steve the bar owner is making a buck off a trademark name that is as common as Kleenex and Diet Coke (darn, am I going to get in trouble for saying their names?) I guess a calendar maker can’t put “Superbowl Sunday” on the February 5th date of their calendar without paying the NFL millions of dollars. They are just going to have to call it “The Big Game Sunday”, because we all know what that means (is it ok to even THINK it? )….just don’t print the actual words and you are ok. What rubbish. 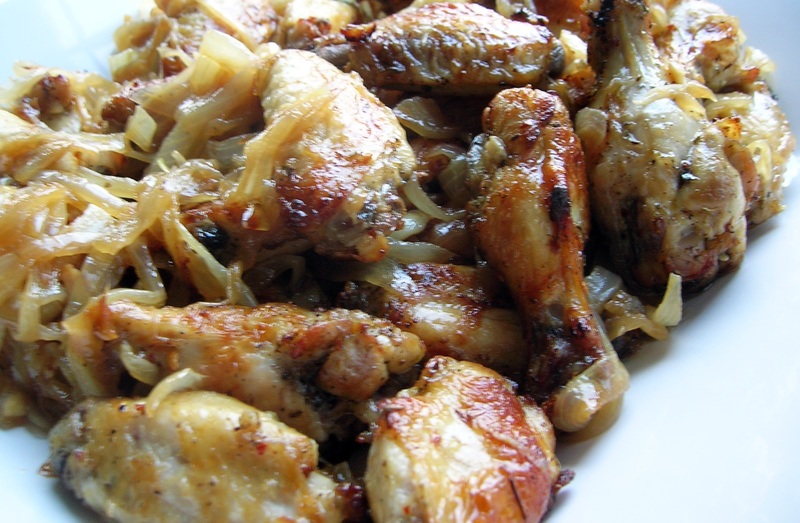 Hope you all enjoy The Big Game…wink, wink, next Sunday and try these wings. I made these wings one weekend using all the flavors I loved growing up with. 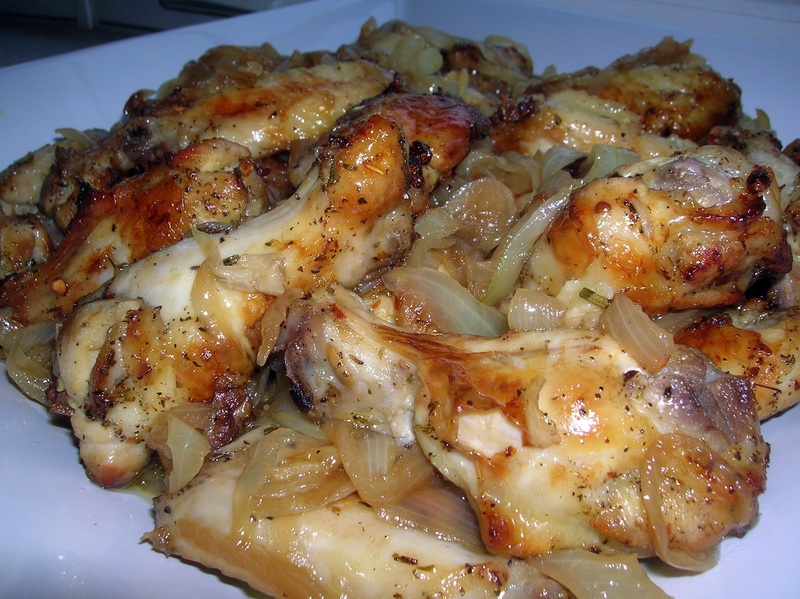 The freshness of lemon on chicken, rosemary and herbs, and the fried onions that used to caramelize at the bottom of the roasting pan the Sunday chickens were cooking in. Add a little sweet/sour flavor with the vinegar and it pulls all together, each flavor complementing the other. You taste the vinegar first and then the undertones of the lemon in the chicken come through. Hope you enjoy these! In a blender place the lemon juice, zest, extra virgin olive oil, oregano, basil, rosemary leaves, red pepper flakes, salt and pepper. Blend until all the herbs are broken down. Rinse the wings well in cold water. Don’t bother drying them off. 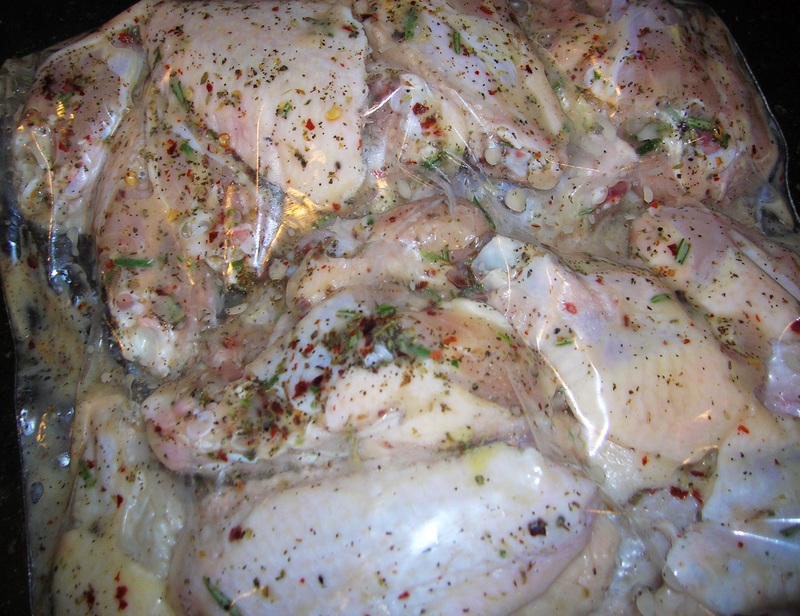 Place the wings in a zip lock bag and pour in the marinade. Seal the bag and mix around the wings until everything is coated. Place the bag flat in the refrigerator at least 4 hours. Turn once during the second hour, or every hour. Take the wings out of the marinade and place on a broiler pan and broil the wings until they are golden brown on both sides and crispy. This takes about a half hour to forty five minutes. If you have access to a grill or BBQ all the better. These are great wings to make at a tail gate party! Just make the onions at home and warm them up at the tail gate. In the meantime, place 1/2 cup of olive oil in a large frying pan over medium high heat. Add the sliced onions, season with salt and pepper and cook until the onions start to caramelize. 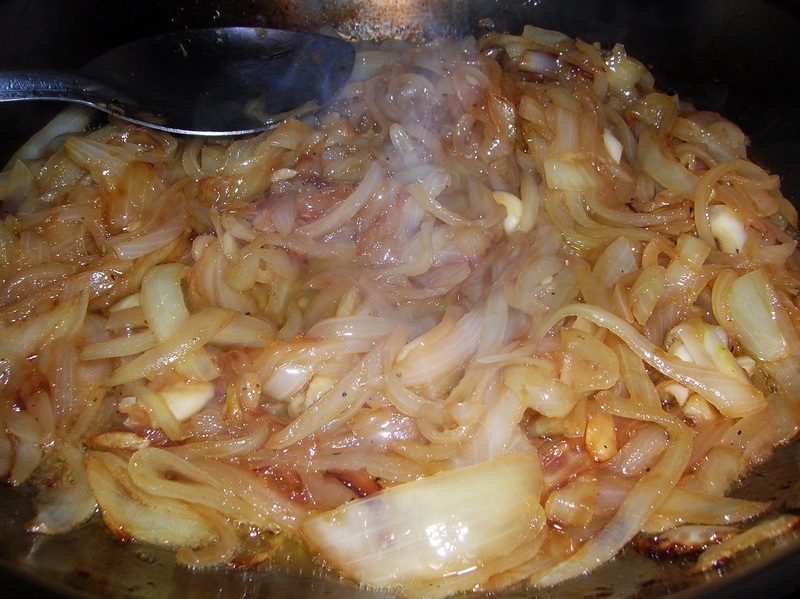 Once the onions are caramelized add the garlic and continue cooking until the garlic just starts to turn amber. The onions should be well caramelized by now. Add the vinegar and sugar and stir for 30 seconds. 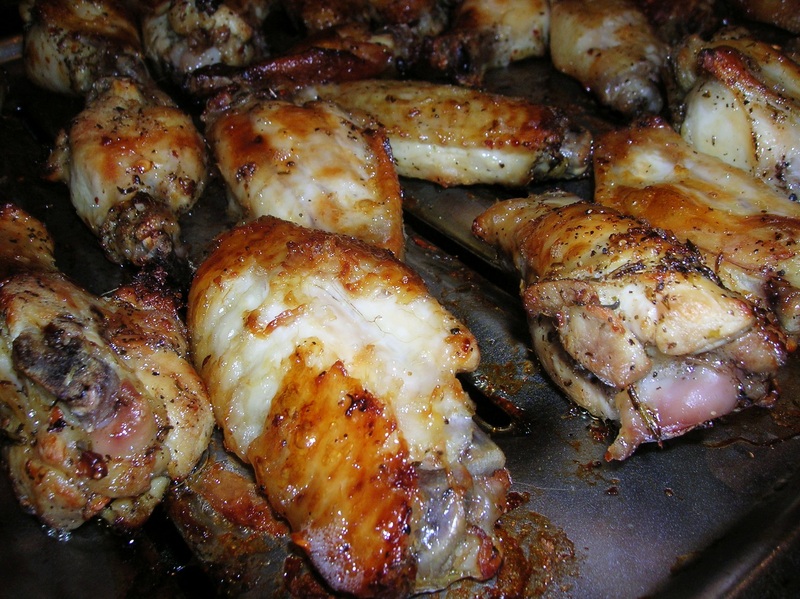 Remove from the heat and pour over the cooked wings that are right out of the oven. Mix in a large bowl and then plate them. This entry was posted in Antipasto, Chicken and tagged Italian wings, Sicilian wings, superbowl sicilian wings, superbowl wings. Bookmark the permalink. Morning Peter !! One would think the NFL has enough money ! Your post is safe with me…nobody likes a rat !. I’ve made many of your recipes and got rave reviews. Can’t wait to try this one. Thanks for posting pix’s, they help a lot.Making zeppoles today…yummy! I’m with you Peter, Let’s Go Giants!!! Thanks Karen, I’m happy to know you got my back! lol! Zeppoles sounds wonderful. I’ll eat them either with powdered sugar or an anchovy in the middle. I love it that way! Enjoy! Marianna, seems she started an entire new food group.Necessity is always the mother of invention. Your most certainly welcome Marianna. Glad they were a hit. The whole meal sounds wonderful! Superbowl Sicilian Wings. How many will this serve? Billie, I brought three pounds of wings to a super bowl party and they were enough for 15 people. But that is with a bunch of other food that was served at the party. If you had nothing but these wings…I would say four people. That’s why serving size is not always an exact science. It usualy involves other factors. Best thing is to go by your judgement and experience. The first time I had these was in Naples Florida at a restaurant called Verginia. I had never had anything like this before. I had to find this recipe. Well..,…. I made these tonight and they were absolutely the best chicken wings! I made 3.5 pounds and they were gone in a flash!! Thank you for such a fantastic recipe!! Debbie, I’m glad you enjoyed them. Made them again today! My grandchildren devoured them. This time I also made a batch on chicken tenders. I cut them into pieces and then followed the directions A tad dry. Next time I will cook whole and then cut.